This 100% cotton batik has been hand printed and painted in India, this art is believed to have first originated in India and moved to other areas in Asia, notably Indonesia, Malaysia, Sri Lanka, and Thailand. The image is created by covering parts of the cloth with wax and then dyeing the cloth. This process of waxing and dyeing can be repeated to create more elaborate and colourful designs, such as this Bob Marley batik. For the very many fans of iconic singer songwriter Bob, this beautiful batik will make a super wall hanging, it will also remind them of what was regarded as one of the maestro’s most memorable songs amongst the many we remember. This batik was hand crafted by Indian craftsmen using traditional methods and because of this method, no two are identical and some variation in finish has to be expected. 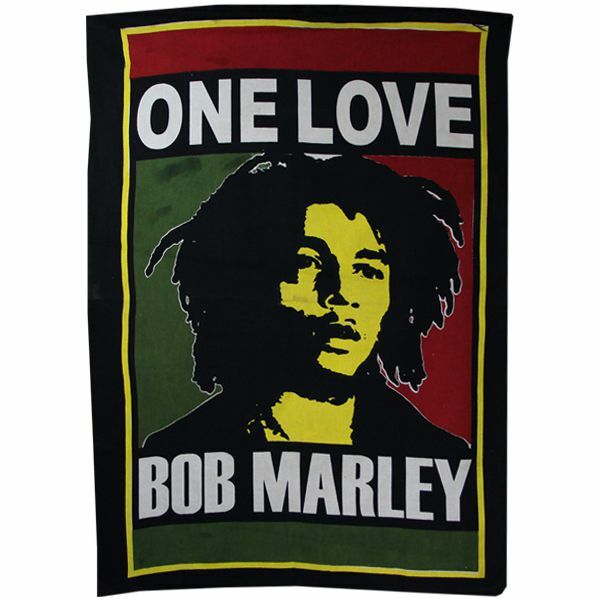 Measuring approximately 103cm x 74cm this batik will provide a super wall hanging to any room and is sure to make it feel a loving and funky place, even more so if it is an accompaniment to the One Love Bob Marley bedspread.